A Japanese sushi boss has paid a record $3.1m (£2.5m) for a giant tuna at the first new year’s auction in Tokyo’s new fish market. 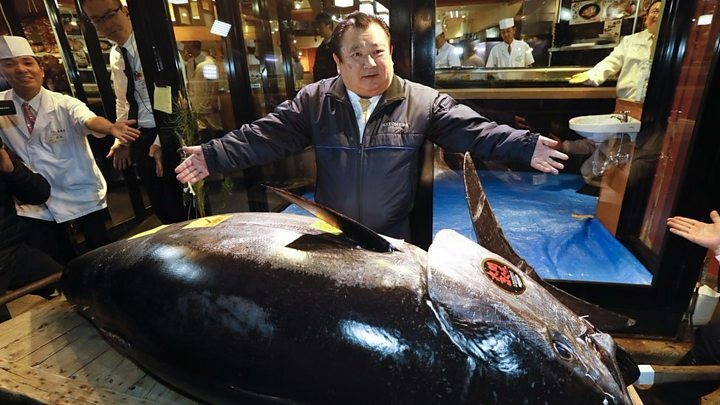 Self-styled “Tuna King” Kiyoshi Kimura bought the 278kg (612lbs) bluefin tuna, which is an endangered species. He spent more than twice the previous record of $1.4m, which he paid in 2013. Wholesalers and sushi company owners often pay high prices for the best fish at the first pre-dawn auction of the new year. “I bought a good tuna,” Mr Kimura told AFP after the auction. Mr Kimura has been the highest bidder at the new year auction for seven of the past eight years. On a normal day a similar sized fish would sell for around $60,000. Today’s record is in part about status – and it creates a lot of publicity for Mr Kimura and his sushi empire. But it is also a reflection of the scarcity of large Pacific bluefin tuna. They are officially listed by the WWF (World Wildlife Fund) as an endangered species. In 2018 catches off the coast of Japan were significantly down, and since the middle of last year prices in Tokyo have climbed by more than 40%. The 2019 auction is the first new year sale to take place at the new fish market on the site of a former gas plant in Toyosu, which opened in October. The previous site at Tsukiji opened in 1935 and became the world’s biggest fish market and a popular tourist attraction. However issues including concerns about outdated fire regulations and hygiene controls prompted the market to be moved to a larger and more modern site. The International Union for Conservation of Nature’s Red List of Threatened Species says Atlantic Bluefin are endangered while the Pacific Bluefin are vulnerable. Last month Japan announced it would restart commercial whaling. The country said it would withdraw from the International Whaling Commission (IWC), which banned commercial whaling in 1986 after some species were driven almost to extinction. Conservation groups have warned that the move will have serious consequences.